This blade is commonly called buneng ken kutsilyo (sword and knife) usually used for “pangkayas” (for scrapping) in the Ilocos region; its smaller width and tapering blade shape releases vibration after impact on wood (for example, bamboo). The influence in design of Spain’s Espada Ancha is evident on overall look of the blade. The use of this blade in martial arts is traced to the movements of the European fencing that the Spaniards called “Escrima”. 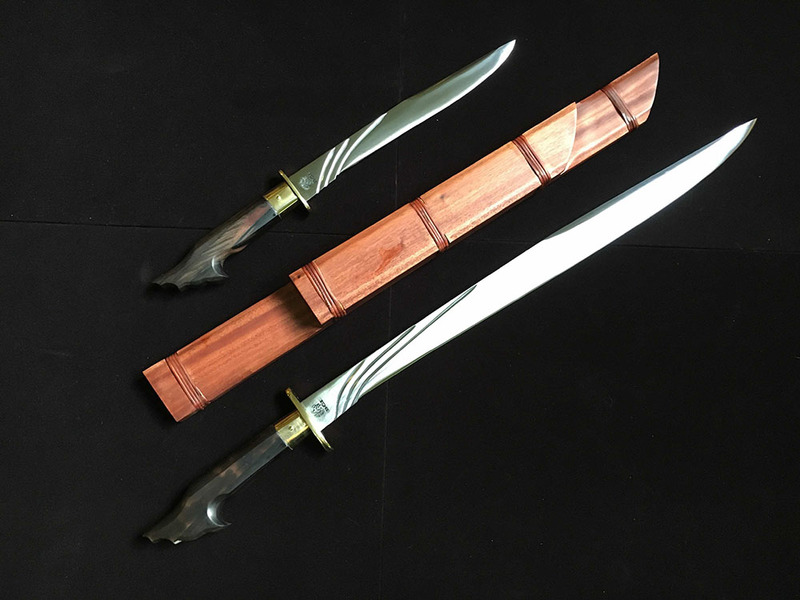 The Filipinos’ study of the offensive movements evolved sword-and-knife techniques for fighting systems called Arnis and Eskrima in long, middle, and long range encounters. BLADE: 5160 Carbon steel, a set weapon ( a sword and a knife blade) selective tempered to its applicable hardness for the sword (machete hardness)and knife ( for utility knife hardness) , grooves signifies the “BATEK/BATIK”(ancient marks/Tatoos Of Maharlikan(filipino) Warrior. SHEATH: Mahogany, Kiln and cured to aged; Natural finish to show wood grain and authenticity and uniqueness of each piece. beautifully hand curved with rattan wrap in each scabbard partition to ensure and prevent the scabbard to split. 5160 Spring Steel Sharpened Blade. Kamagong Ebony Wood Handle and Mahogany Scabbard. Brass Fittings. Premium Quality Construction.